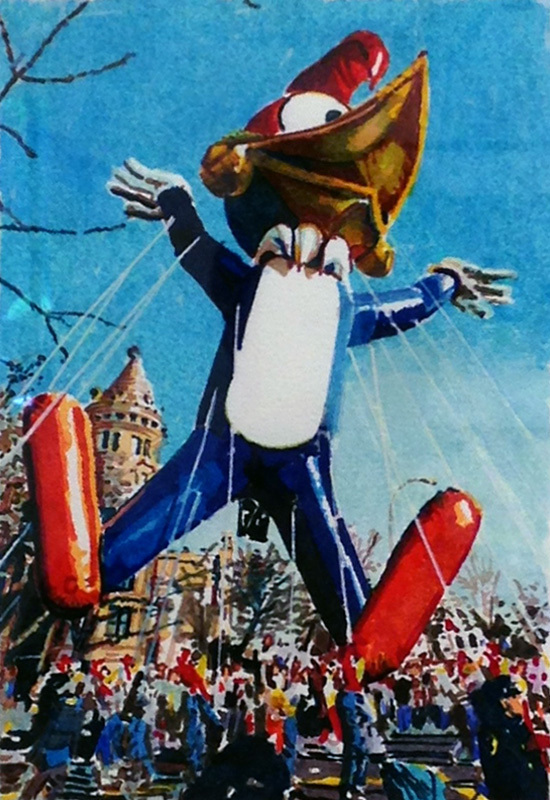 Ron Kleemann, Study for ‘Pecker Heads’, Jonathan Novak Contemporary Art. Click to inquire. New Years Eve draws tremendous crowds with the lure of spectacular fireworks. Inspired by the thrill of sharing in the excitement-but also with the annoyance of traffic, this FADAblog posts highlights FADA Member Gallery inventory of crowds. In reflection on the history of depicting crowds, one also notes the most original artwork of a clongomerate, the Ara Pacis friezes documenting the Roman Triumph of Augustus’ times. Mary Henderson, Marchers, Oil on panel, Arcadia Contemporary. Click to inquire. 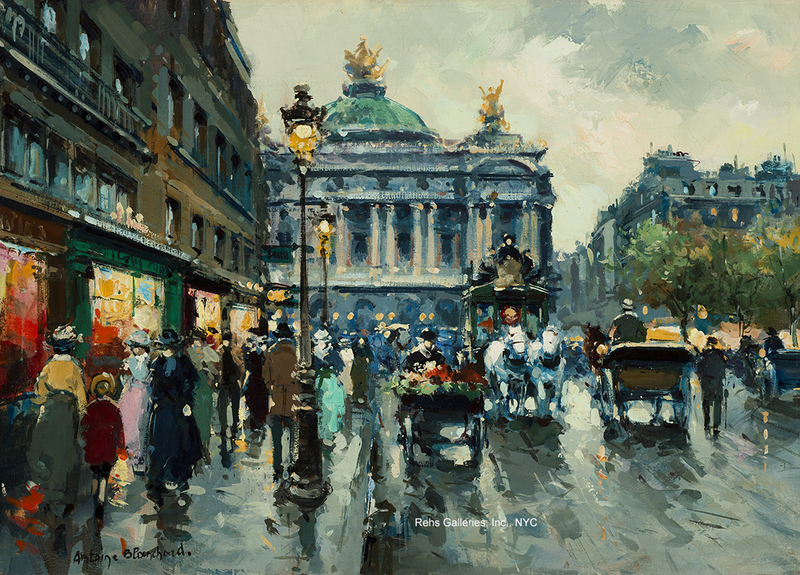 Antoine Blanchard, Avenue de L’Opera, Oil on canvas, Rehs Galleries, Inc. Click to inquire. 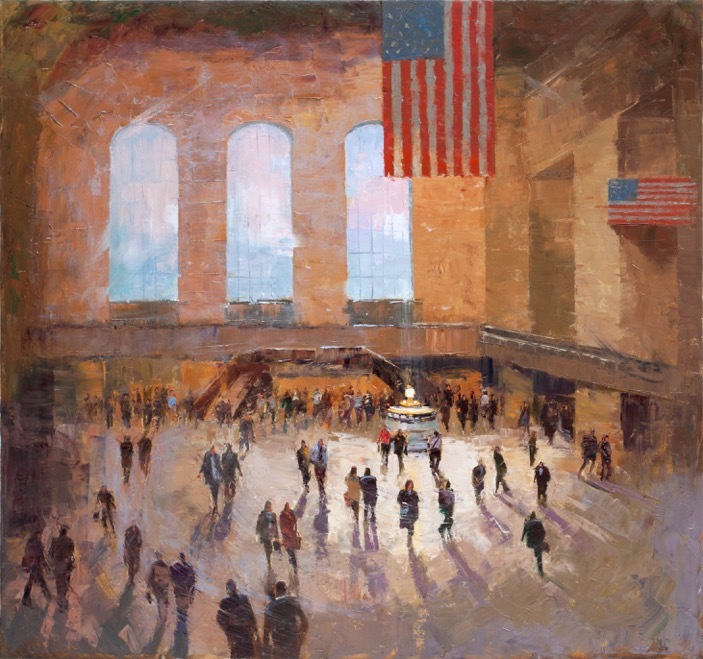 In lieu of personalization, artworks depicting crowds seemingly present one shared idea. Breughel’s sixteenth-century The Harvesters lacks the personalization of a portrait and typifies (and humorizes) peasants. In Southern Europe, Florentine frescoes, like Gozzoli’s Journey of the Magi in the Medici Palace, includes portraits of the Medici family within the religious procession in a unified testament to the elite family’s wealth and importance. 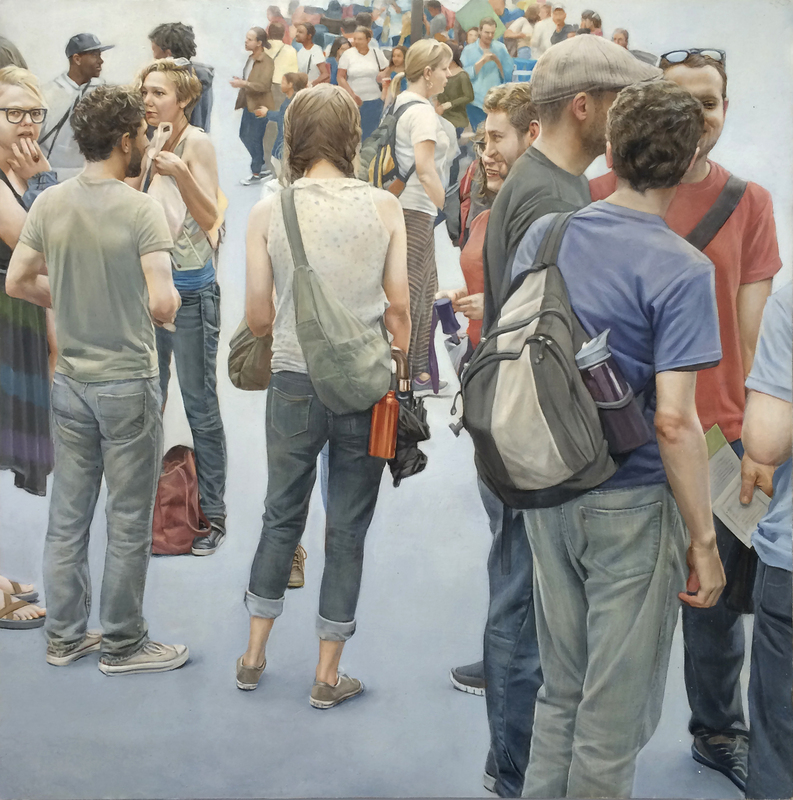 Michele Byrne, Community, Oil on canvas, Eckert & Ross Fine Art. Click to inquire. 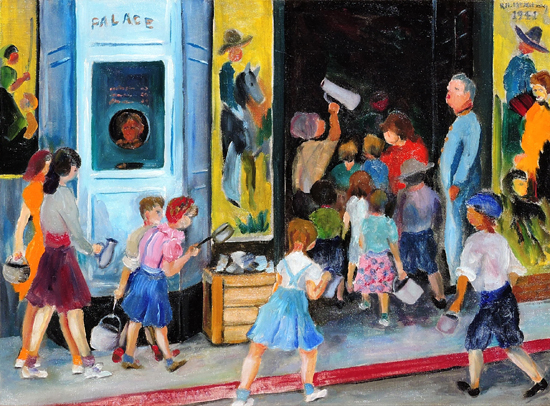 Ralph Huntington McKelvey, Children at the Movie Theater, Oil on canvas, George Stern Fine Arts. Click to inquire. In regarding FADA Member Galleries’ inventories in context to crowd depictions, they most definitely evoke Post-Industrial, capitalist displays of middle-class leisure. Whether on the way to the movies or as spectators to parades, the artistic depictions of modern and crowds reflect the intricacies of contemporary public interaction. 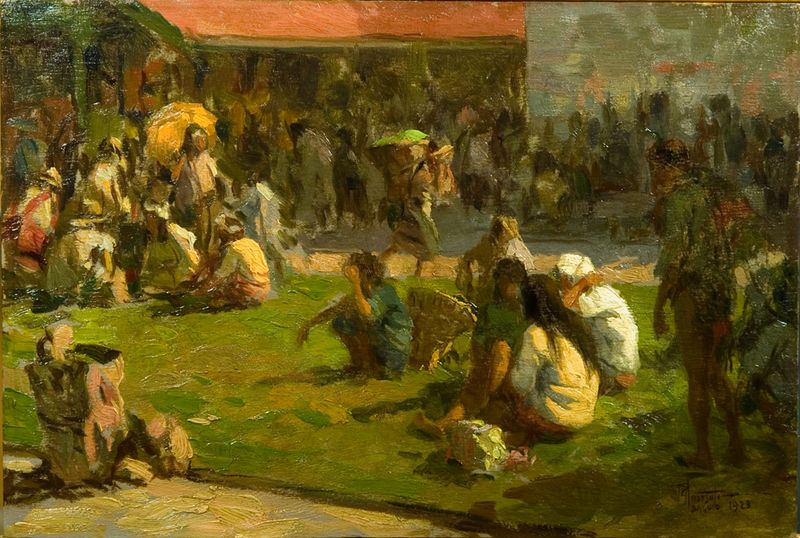 Fernando Amorsolo, Sunday Market Baguio, Oil on board, Douglas Frazer Fine Art. Click to inquire.